I started this particular Armourfast T-34/85 (No. 99009) when I was living in the Bay Area. How, you may ask, can someone make so little progress over two years with a model that consists of only eight pieces? To which I would have to reply, that this model needs a lot of work to make a passable T-34. The first thing I had to do was to thin down the treads. 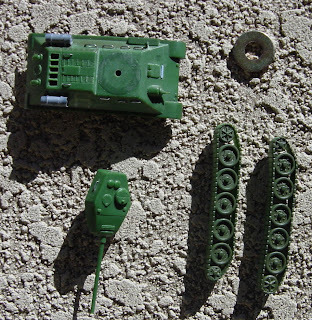 The treads were so thick that they made the tank tower over other 1/72 T-34s. The next step was to drill holes in the wheels and add bolt heads on the road wheels. 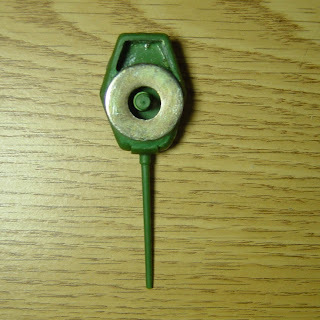 I used the little beads from the inside of a Brita pitcher filter cartridge for bolt heads. Unfortunately I lost all the beads when I moved, so only the right wheels have bolts in them. I added some fuel drums from a PST tank kit, a scratchbuilt headlamp, and wire grab handles. Recently I decided to try and make some progress on this kit, so I shaved off the turret ring that was molded into the hull of the tank. This ring should be part of the turret. I affixed a 22 mm washer to the turret using CA glue, and applied Kneadatite to fill in gaps. The diameter of the washer is slightly large, but I could not find anything 21 mm at the hardware store. If the washer looks asymetrically positioned, it is because a) I needed it positioned so that the turret could rotate freely, and b) because the turret actually is asymatric on this model. Here are the figures from my previous entry on TDSC-11 painted up. It's been many years since I've actually painted any metal miniatures. 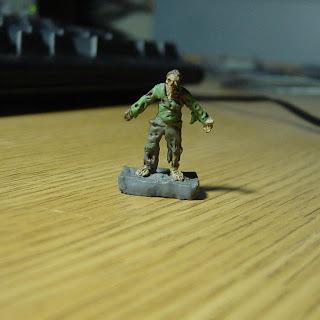 I finished the zombie very quickly, but the other two figures took a bit longer. Actually, the Gothette was quite simple to paint since she is all in black except for the pink highlights in her hair, and the green skull logo on her shirt. The backpack worn by the Gothette is Hoshimaru from Shadow Star and was made of Kneadatite. I think it came out quite nicely. I'm not really happy with the way the Wedding Dress Goth turned out. I thought that the purple skirt would look pretty cool, but after I finished it didn't look as good as I though it would. I do like the way that the rabbit turned out though. The close up images kind of make me cringe. 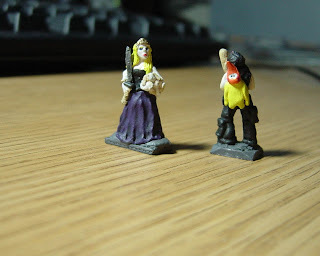 The camera is not very forgiving of my painting skills. 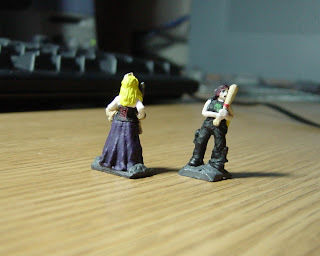 I suppose I will get better as I paint more figures though.